Ladera Vista Junior High School of the Arts is an Official 2016 Golden Bell Award recipient. Ladera Vista Junior High School of the Arts was chosen as one of 56 recipients of the State’s leading educational honor, the Golden Bell Award. The Golden Bell Award, now in its 37th year, is sponsored by the California School Boards Association. The award recognizes public school programs that are innovative and sustainable, make a demonstrated difference for students and focus on meeting the needs of all public school students. Ladera Vista Junior High School of the Arts will receive its award at a recognition ceremony to be held on Saturday, December 3, 2016 from 11:45 a.m. to 2:00 p.m. at CSBA’s Annual Education Conference and Trade Show in San Francisco. ​Ladera Vista Junior High School of the Arts received this award in recognition of the Urban Agriculture Community-Based Research Experience (UACRE) program that supports scientific practices, sustainable agriculture, healthy food choices, and cross-curricular connections for junior high school students through a variety of hands-on experiences in beautiful school gardens and in classrooms across campus. “I am honored to receive the honor of the Golden Bell Award on behalf of the UACRE Program at Ladera Vista School of the Arts. This amazing program is just one of the great collaborations we have with community partners that enhances the educational resources and personalized learning opportunities for our students,” said Randa Schmalfeld, Principal at Ladera Vista School of the Arts. The overarching goal of the Ladera Vista UACRE Program is to support positive partnerships and practices in the area of sustainability. Objectives include hands on experience in our school gardens, work with our vermicomposting project, collection and analysis of scientific data related to the gardens, understanding of the historical and cultural significance of sustainable food practices, and firsthand student experience in preparation of the many crops grown in our gardens. The Ladera Vista UACRE Program supports students in making meaningful connections in their learning and lends itself to a variety of cross-curricular connections in Science Language Arts, History Social Studies, Visual Arts, and Culinary Arts. The Fullerton School District is located in northern Orange County, California and serves over 13,000 students in grades TK – 8th. 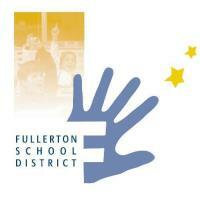 The Fullerton School District includes 20 schools, 15 elementary schools, two K-8th grade schools, and 2 middle schools. The mission of the Fullerton School District is to work collaboratively with the community to provide an innovative, high-quality educational program for all students in a safe learning environment. The District motto, “Great Schools - Successful Kids” exemplifies the belief that all students will achieve academic excellence, acquire interpersonal skills, and develop technological expertise to contribute as productive citizens in a democratic society. For more information, call 714/447-7400 or visit www.fullertonsd.org.